Earn $46.71 in VIP credit (4671 points)What's This? 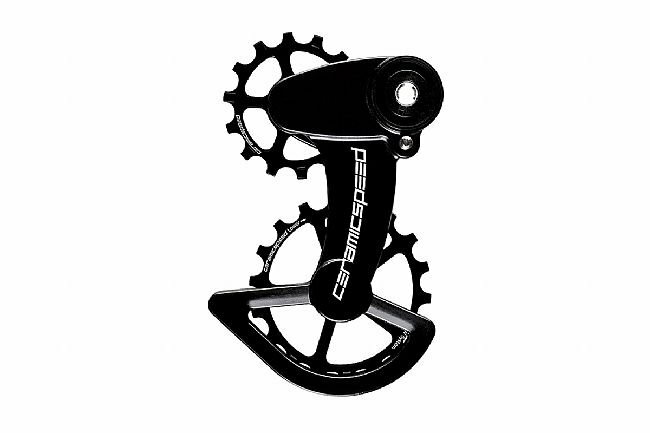 Ceramic Speed's OSPW X for SRAM Rival & Force 1 Type 3 Derailleurs offer a super fast pulley wheel system, featuring 14-tooth (upper) and 18-tooth (lower) pulleys with a narrow-wide profile. The unique narrow-wide tooth profile of the pulleys ensures durable chain retention. The system is fitted with a custom designed, strong carbon fiber pulley cage assembly for durability and lightweight. The cage design allows you to choose between two spring tension settings to customize performance and reduce chain drag. Thanks to the high-quality CeramicSpeed bearings inside, this system will benefit from 3-5 times longer life.